I'm going to build editing PC for HD, 4K and HDR. Editing, grading and rendering is done on DaVinci Resolve Studio plus Neat Video, on Windows 10 64bit. All will be done on this PC, no cloud and no collaboration with others. Hard drives: for the Operating System - 5000Gb Nvme SSD; scratch disk - 1TB SSD. 1. Is there any benefit to Windows 10 Pro over the Home version? 2. Choosing processor, does Core i9 9900K have a significant benefit over Core i7 8700K? 3. Choosing processor and Mother Board, in either processor, will overclocking be a significant benefit? 4. Concerning RAM, will 32GB be a significant benefit over 16GB? 5. Concerning RAM, is there a significant benefit for 3,600MHz over 3,200MHz or 3,000MHz and/or CL18 over CL16 or CL15? 6. Concerning scratch disk SSD, will Nvme one have a significant benefit over SATA one? 7. Concerning Graphic Card, will RTX 2080 Ti have a significant benefit over GTX 1080 Ti? Joshua_G wrote: I'm going to build editing PC for HD, 4K and HDR. Editing, grading and rendering is done on DaVinci Resolve Studio plus Neat Video, on Windows 10 64bit. All will be done on this PC, no cloud and no collaboration with others. Joshua_G wrote: 1. Is there any benefit to Windows 10 Pro over the Home version? Yes, you can turn-off automatic updates and configure it better for your needs. Joshua_G wrote: 2. Choosing processor, does Core i9 9900K have a significant benefit over Core i7 8700K? Both are to expensive these days (Newegg prices) i9-9900k(16PCIe-lanes) $580, i7-8700k(16PCIe-lanes) $380 vs. AMD TR1920x(60PCIe-lanes) $435, Ryzen7-2700x(20 PCIe-lanes) $305 incl. cooler. Joshua_G wrote: 3. Choosing processor and Mother Board, in either processor, will overclocking be a significant benefit? Joshua_G wrote: 4. Concerning RAM, will 32GB be a significant benefit over 16GB? Joshua_G wrote: 5. Concerning RAM, is there a significant benefit for 3,600MHz over 3,200MHz or 3,000MHz and/or CL18 over CL16 or CL15? Joshua_G wrote: 6. Concerning scratch disk SSD, will Nvme one have a significant benefit over SATA one? Yes Sata is ~ R/W 500 MByte/s Samsung 970 Pro 1 TB ~ R/W 2500 MByte/s. Joshua_G wrote: 7. Concerning Graphic Card, will RTX 2080 Ti have a significant benefit over GTX 1080 Ti? Yes but you can buy 2 RX Vega's (2x$500=$1000) for less than 1 RTX2080ti (atleast $1200 if you can get one). And 2 Vega's are a lot faster than 1 RTX2080ti. Joshua_G wrote: 8. Any other suggestions? Spend your money on good equipment not on products with an extreem marketing budget. There are not a lot of feedback regarding 2080ti on Resolve. I don't know if dvr can currently use all possibilities of this matérial but this is the future. To me if you can spend money on this, go ahead ! Ram and cpu is also important. Depending on your project or if you're multi task, 32 go ram is comfortable. Home or Pro ? Home is enough. Jean Rivoire wrote: There are not a lot of feedback regarding 2080ti on Resolve. RT cores aside, memory bandwidth on the 2080 Ti is extremely high. Unfortunately, so is the price, so it's better to by 2x of something else. Of course the price is high. 1080ti is still à good product. I dont think you'll be disappointed with it. graphic card is the most important using resolve. With the pc you'll be able to upgrade it when your budget will allow it. Jean Rivoire wrote: Of course the price is high. 1080ti is still à good product. I dont think you'll be disappointed with it. graphic card is the most important using resolve. Never use Sli it doesn't work, Sli is for gaming not for compute(Resolve). Which Mother Board would you recommend for AMD TR1920x? Depending on your needs, the cheapest. When you want to be able to upgrade later to a faster Threadripper CPU I would go for the Gigabyte - X399 DESIGNARE EX ATX TR4 Motherboard(for possible thunderbolt 3 support in the future) or the ASRock - Fatal1ty X399 Professional Gaming ATX TR4 Motherboard when you want onboard 10 G ethernet. 1. What cooling would you recommend for AMD Ryzen Threadripper 1920X, when it may be overclocked? 2. What PSU would you recommend for the above plus 2 x Gigabyte RX Vega56 Gaming, when they may be overclocked? 3. Will the Gigabyte X399 Designare EX with Ryzen 1920X hold 2 x RX Vega56 plus 2 x NVMe M.2 SSD drives? Joshua_G wrote: 1. What cooling would you recommend for AMD Ryzen Threadripper 1920X, when it may be overclocked? When you do heavy overclocking on the CPU make sure that you let a (cheap one 8 or 12 cm at 7 or 12 volt)ventilator blow at the VRM cooling block (Gigabyte calls this "IR Digital CPU Power Design"). Enermax LIQTECH TR4 II (240, 280 or 360) depending on the room in your case, the cooling performance you need and your budget. Joshua_G wrote: 2. What PSU would you recommend for the above plus 2 x Gigabyte RX Vega56 Gaming, when they may be overclocked? so pick at least a 1200 Watt PSU. Joshua_G wrote: 3. Will the Gigabyte X399 Designare EX with Ryzen 1920X hold 2 x RX Vega56 plus 2 x NVMe M.2 SSD drives? MishaEngel wrote: When you do heavy overclocking on the CPU make sure that you let a (cheap one 8 or 12 cm at 7 or 12 volt)ventilator blow at the VRM cooling block (Gigabyte calls this "IR Digital CPU Power Design"). I live in Israel, so brands availability is somewhat limited. There are liquid cooling options from Corsair, Fractal Design, Antec Mercury and NZXT Kraken, in various price ranges. MishaEngel wrote: You can overclock the VEGA56 to the extremes … so pick at least a 1200 Watt PSU. I believe it should be an 80+ one. Is that correct? You must have review sites in Israel, so someone should have tested some coolers for Treadripper TR4 socket. The PSU is the most important part of your workstation, don't try to save money on this item. 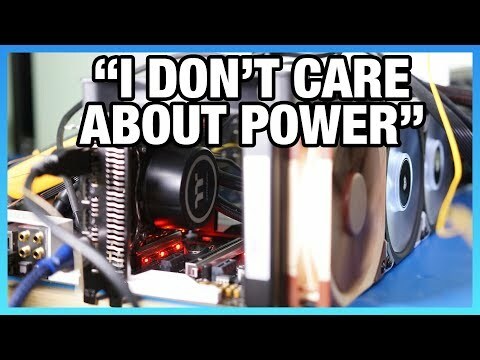 We use a Corsair 1500 watt platinum (1950x + 2 Vega FE's all are overclocked and watercooled). Pick atleast a 1200 watt 80+ gold EVGA, SeaSonic, corsair, etc..
MishaEngel wrote: The PSU is the most important part of your workstation, don't try to save money on this item. This is very good advice. In the last few years I don't think I've seen any components fail except PSUs and a couple sticks of RAM. Worst case scenario, PSU can take something else with it! One more question. When installing 2 Graphic Cards, do they, or the PC, or the OS, or Resolve, have to be configured in any way for both of them to be utilized? (I never had 2 Graphic Cards on 1 PC). witch is better for Davinci, Windows or macOS if the HW is the same? Just finnished upgrading a mac pro 2009, 12 cores 3.5 gHz 64 gb,RX580 for now, thinking changing it to vega 56, thinking should I install Windows also on it, will be using also FCPX. Hackintosh would also be also an altrnative if macOS is more efesient etc. Not that I remember, otherwise look in the Davinci Resolve Manual. Kim Janson wrote: witch is better for Davinci, Windows or macOS if the HW is the same? Just finnished upgrading a mac pro 2009, 12 cores 3.5 gHz 64 gb,RX580 for now, thinking changing it to vega 56, thinking should I install Windows also on it, will be using also FCPX. Not a huge difference, they are both optimized pretty well. I use hackintosh for prores encoding (Threadripper 1950x + 2 Vega FE's) from a different SSD (yes I switch them, one has Windows and some Linux forks and the other one has MacOS). The necessary "configuration" for 2 graphics cards is that you only plug 1 card into your monitor (s). The card that is not plugged in to a monitor is then seen by Resolve as computation only. I would suggest you look into a third card. A cheaper card for you GUI, freeing up your other 2 cards for nothing but computation. This is how my system is setup. As well, if you are spending as much money as it looks like you are, I would suggest 32 gigs of RAM is the absolute minimum...spend some of your money on more RAM. Glenn Sakatch wrote: I would suggest you look into a third card. A cheaper card for you GUI, freeing up your other 2 cards for nothing but computation. This is how my system is setup. This is only valid when one GPU is way faster than the other GPU. Driving the GUI is a task with very low resources for current GPU's. I'll go for 64GB RAM. Does it make any difference if it comes with 2, 4 or 8 sticks? Joshua_G wrote: Thanks, Glen and Misha. 4x16 GB is the best. When you do only Resolve and not Fusion 4x8 GB is enough. Since I do only Resolve, not Fusion, I'll go for 4x8 GB. That will save you a lot of money, you can always add 4x16GB in a later stage(to get a total of 4x8 + 4x16 = 96 GB). I can get locally either Corsair DDR 4 32G (16Gx2) 3200 CL16 for about $406 (including local taxes), or Corsair DDR 4 32G (8Gx4) 4000 CL19 for about $684. I doubt whether the second option is worth the extra money. it depends how your MB access the memory, how many memory banks does it have, often some memory locations are recommended to be find first etc. The speed of course affect too but so does CL and even more how well the bios settings are optimised. Getting 16 Gb modules, you can add more later on, also you could get 3 of them at the prise of 4 8 Gb. But I think you are a bit over thinking it. on these matters it is very difficult to get any definitive answer without testing and comparing and the difference in real life probably is not that much. With the first option you will only fill 2 of the 4 native RAM channels so I would consider this as a no go. The second option is way to expensive. Go for 4x8GB atleast DDR4-3200 CL16 (should cost around $300). I have to go with what's available locally, because of warranty. It may take few weeks before I'll order the new PC, I'm waiting some money to come in. Right now, locally there's only 32G (16Gx2) 3200 CL16. If by the time of making the order there will be 4x8GB, I'll go for it. Else, I'll go for 2x16GB. I can get 2 sets of 16GB (2x8GB) each, making 4x8GB altogether, but the 2 sets aren't matched with one another, so I hesitate. So does Amazon, B&H and others. For those who don't ship to Israel, there are few parcel forwarding services. Shipping isn't an issue at all, then problem may arise should the warranty need be fulfilled. In such a case, the time for back and forth shipping, the shipping costs and the procedure of export for import (so as not to pay the local taxes again) makes it not worth my while to buy from abroad. So, my present debate is between 1 matched set of 2x16GB and 2 unmatched sets of 2x8GB each. Grab your phone and call them if and when they can deliver a set of RAM that suits you. Israel is by far the most IT focused country in the middle-east so it should be no problem to get some descent RAM for a descent price. My experience is that a phone call helps more than sending 100 e-mails(no matter what country you live in).